This week at Higher Fyah the Reggae Club we haD from Italy - SUPER BROS, singer and DJ will be throwing down his selection in an exclusive dj set! Being Italian is all about the passion, SUPER BROS aka Mario Tortorella, is super passionate about djing and singing. 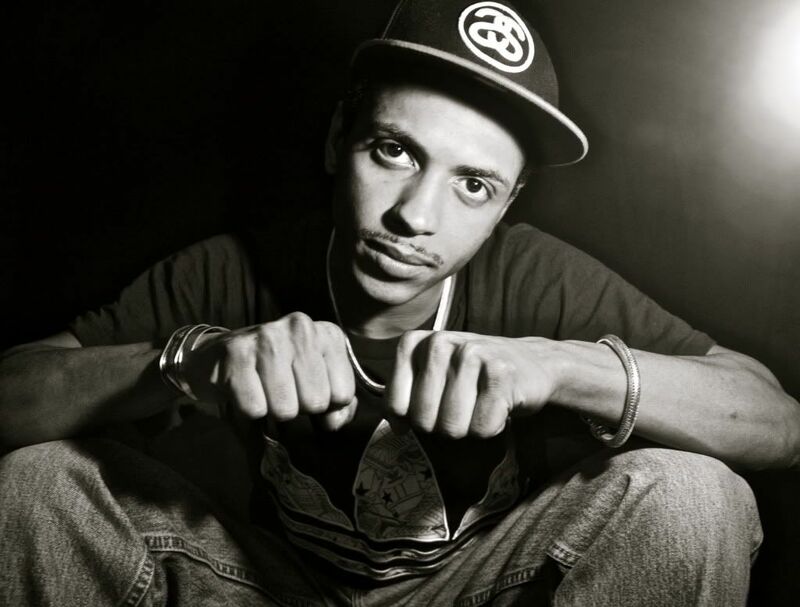 This week at the Reggae Club for the first time VJ KEVO!! full of style and patten DJ CALVIN!! DJ TEDRO always a classic selection! 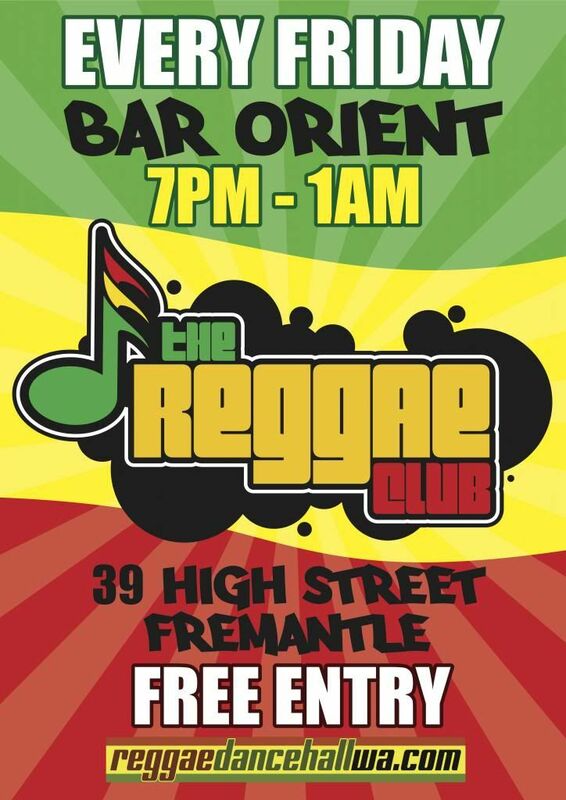 Reggae every friday at Bar Orient THE REGGAE CLUB- HIGHER FYAH it feels like a party! LINE UP FOR THIS WEEK!!! the dj that is responsible for the GRAMPS MORGAN MIXTAPE DJ RAY the mix tape master!! will be live on the decks!! reggae radio royalty RTR FM legend GENERAL JUSTICE!! and THE EMPRESSIONS MUMMA TREES AND SISTA CHE...party mi say!!! Come down and warm up for the reggae event of the year REGGAE RISING featuring GRAMPS MORGAN! This week is going to be maddd!! DJ SUPA BROS FRESH FROM HIS KILLER PERFORMANCE SUPPORTING THE ONE AND ONLY GRAMPS MORGAN REGGAE ROYALTY!!! THE EMPRESSIONS ALSO READY FOR FOR PLAY FULL UP OF INSPIRATION FROM THE ONE mR GRAMPS MORGAN!!! Fresh to the club, Zambian dj CHIO mega mix master. Next Friday 21st September... 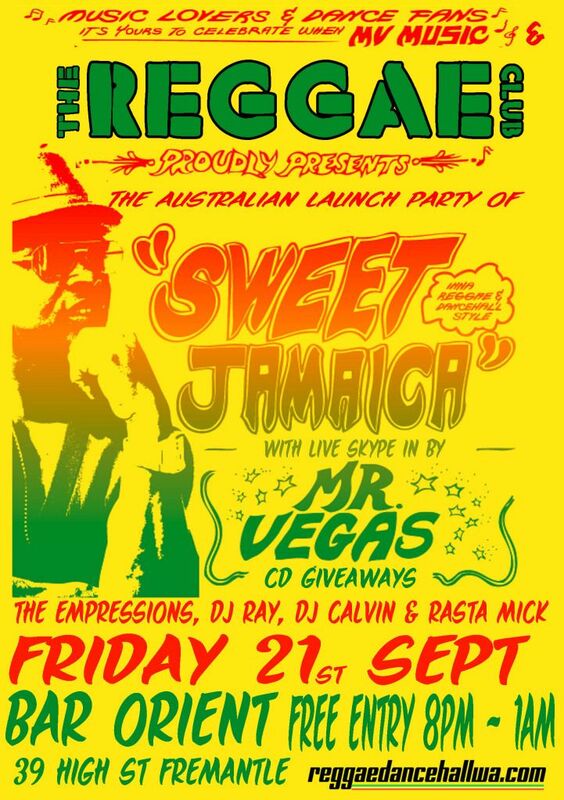 The Australian Launch party for Mr Vegas Lp 'Sweet Jamaica". Mr Vegas is planning to skype us LIVE on the night on the big screen (God and technology willing lol)...Cd, poster and reggae magazine giveaways on the night! this week at the REGGAE CLUB! Peter Tosh is most defiantly one of Jamaica's finest musicians and musical forces. He was one of the core member of The Wailers alongside Bob Marley and Bunny Wailer. He wrote the revolutionary son 'Get Up Stand Up'. Won a Grammy and continues to inspire so many reggae artist all around the world. Artist such as South Africa's Lucky Dude, Bushman and Gramps Morgan was spotted wear a Peter Tosh shirt when he was on tour in Perth last month! After his time in the Wailers Peter Tosh went on to have an exciting and successful solo career. He put together the amazing band Word, Sound and Power as a backing band for recording and touring. Tosh was lifted to a larger audience when he was signed by Rolling stones record in 1978 and dropped the Bush Doctor album.Featuring the duet with rolling stones; Mick Jagger, 'Don't Look Back'. Peter Tosh fought diligently for equal rights and justice he took part in the anti apartheid concerts and has several trax making his point of view very clear...'Apartheid, Equal rights, fight on and not gonna give it up. Tosh was know for his lively stage performances where he preached his point of view on several issues, Rastafari, equal rights, the love of reggae music, legalization of marijuana and no nuclear war.Sometimes while riding a unicycle cause he could!! 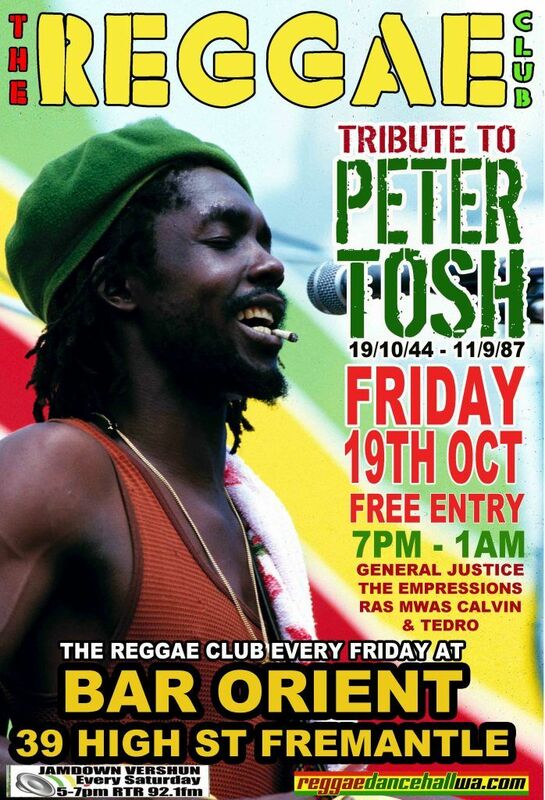 come celebrate the vision and sound of the great Peter Tosh an amazing reggae artist, at The Reggae Club this friday night with djs General Justice,The Empressions, Ras Mwas (Kenya), H-Mut (Zim) and Tedro. PLAYING ON THE BIG SCREEN - Tosh vids and interviews !!! Fremantle ! Very Irie place!